Il gusto della Basilicata: la cucina autentica di Tommaso Lancanfora, aprile. Tommaso Lacanfora: Lucan Inside and Outside his Kitchen (Basilicata 3), Epicurean-Traveler.com, March. Massimo Cifarelli: A Third Generation Baker, La Voce di New York, March. Vitantonio Lombardo: The First Michelin-Starred Chef in Matera, La Voce di New York,, March. Vitantonio Lombardo: Il primo Chef stellato a Matera, La Madia Travelfood, March. Basilicata (Part Two): Massimo Cifarelli: Third Generation Baker in Matera, Epicurean-Traveler.com, March. Massimo Cifarelli: Panettiere di terza generazione a Matera, La Voce di New York, February. Vitantonio Lombardo: il primo chef stellato Michelin a Matera, La Voce di New York, January. Flynn McGarry: Il Justin Bieber del cibo, Uno Chef Prodigio a New York, La Madia Travelfood, November. Kenny Dunn: Fondatore CEO di Eating Europe Tours, Pioniere dei Travefood in Europa, La Madia Travelfood, ottobre. Giacinto Fanelli: una stella nascente a Bari, La Madia Travelfood, ottobre. Piana degli Albanesi: For Its Albanian Culture and the World's Best Cannoli, La Voce di New York, October. Piana degli Albanesi: For its Albanian Culture and World's Best Cannoli, Epicurean-Traveler.com, September. Flynn McGarry, the 19-Year-old Chef Who is Conquering New York,La Voce di New York, August. Flynn McGarry: Wunderkid Chef, Epicurean-Traveler.com, August. Kenny Dunn: The Founder and CEO of "Eating Europe Tours", La Voce di New York, May. "Kenny Dunn: The Founder and CEO of "Eating Europe", Epicurean-Traveler.com, May. Marjorie Shaw: An Insider's View of Italy, La Voce di New York, February. 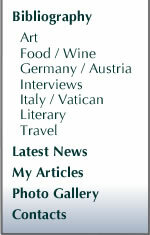 Marjorie Shaw: Insider's Italy Only a Click Away, Epicurean-Traveler.com, February. Maris and Kaspars Jansons: Two of "Rītiņš Boys", Epicurean-Traveler.com, June. Mārtiņš Rītiņš: The First and Still the Brightest Star of Latvia's Culinary Sky, Epicurean-Traveler.com, June. Roberto Naldi: Un albergatore nato, La Madia Travelfood, giugno. Intervista a Stefano Marzetti: Chef Executive Allo Splendide Royal di Roma. La Madia Travelfood, giugno. Rodelio Aglibot "Food Budda": Creatore di oltre 40 ristoranti nel mondo, Italia compresa, La Madia Travelfood, febbraio. Paul Stradner: Tra i bistellati più giovani della Germania, La Madia Travelfood, dicembre. Lisa Calcus, Nicolas Campus: L'Incontro perfetto tra cucina e vino, in Belgio, La Madia Travelfood, novembre. A French Oasis in Baden-Baden with One Michelin Star, Epicurean-Traveler.com, October. Rodelio Aglibolt: "Food Buddha": Epicurean-Traveler.com, September. "Paul Stradner: One of the Youngest Chefs in Italy to Earn 2 Michelin Stars", Epicurean-Traveler.com, September. Lisa Calcus and Nicolas Campus: The Perfect Match, Epicurean-Traveler.com, July. "Gianfranco Cardinal Ravasi: President of the Pontifical council for Culture", Inside the Vatican, April. "Zenzi Glatt: L'albergatrice che ha scritto la storia imprenditoriale di Merano", La Madia Travelfood, aprile. "Monsignor Iacobone: Author and Editor", Inside the Vatican, December. "Zenzi Glatt: Merano's Forever Young Senior Hotelier", Epicurean-Traveler.com, October. "A Manhattan Jack Dell è il Proprietario di 'Katz's', Delifood Ebraico", La Madia Travelfood, settembre. "Jake Dell: The Owner of Katz's, New York city's Oldest and Best Deli", Epicurean-Traveler, May. "Msgr. Jacobone: Holy See's Special Delegate for 'Expo'", Inside the Vatican, May. "New 'Tower' built at North American College" Inside the Vatican, February. "Gastón Acurio: Ambasciatore Mondiale della Cucina Peruviana", La Madia Travelfood, gennaio. "Gastón Acurio: Worldwide Ambassador of Peruvian Cuisine", Epicurean-Traveler.com, December 6th. "Niko Romito: Italy's Only Chef South of Rome with 3 Michelin Stars", Epicurean-Traveler.com, November 29th. "Paolo Marchi: Creatore e Patron di Identità Golose", La Madia Travelfood, novembre. "Heinz Beck: Twenty Years at La Pergola", Epicurean-Traveler.com, October. "Soeren Anders: The Youngest German Chef Awarded a Michelin Star", Epicurean-Traveler.com, September. "1741: Two Interviews at Strasbourg's Top Restaurant", Epicurean-Traveler.com, July. "Niko Romito: la cucina etica dell'unico chef a sud di Roma con tre stelle Michelin", La Madia Travelfood, luglio. "Heinz Beck: Vent'Anni a 'La Pergola'", La Madia Travelfood, giugno. "Gianluca Biscalchin: il primo illustratore giornalista enogastronomico d'Italia nonché aspirante chef", La Madia Travelfood, maggio. "Intervista a Cédric Moulot e Thierry Schwartz, La Madia Travelfood, marzo/aprile. "Natalia Tsarkova: Interview with a Papal Portraitist", Inside the Vatican, February. "Gert de Mangeleer: il più giovane chef belga con tre stelle Michelin", La Madia Travelfood, gennaio/febbraio. "Annie Féolde: La Prima Donna Chef con Tre Stelle Michelin in Italia", La Madia Travelfood, dicembre. "Jean-Pierre Grallet: Archbishop of Strasbourg", Inside the Vatican, December. "Daniel Humm: Lo chef più amato di New York", La Madia Travelfood, novembre. "Annie Fèolde: The First Woman Chef in Italy with 3 Michelin Stars", Epicurean-Traveler.com, October. "Daniel Humm: The Hottest Young Chef in New York City", Epicurean-Traveler.com, August. "Gert de Mangeleer: The Youngest Belgian Chef Awarded 3 Michelin Stars", Epicurean-Traveler.com, August. "Francesco Apreda: Da 10 Anni Executive Chef dell'Hassler a Roma", La Madia Travelfood, giugno. "Francesco Apreda: Celebrating Ten Years as The Hassler's Executive Chef", Epicurean-Traveler.com, June. "Borek Sipek: un artista tuttofare", La Madia Travelfood, aprile. "Richard Fuchs and Marek Fichtner: Promising in Prague, " Epicurean-Traveler.com, March. "Marino Marini: il renaissance man della cucina italiana", La Madia Travelfood, marzo. "Borek Sipek: A Self-Made Renaissance Man," Epicurean-Traveler.com, February. "Michele Lirosi: il co-fondatore e -proprietario del primo agriturismo didattico della Sicilia", LaMadia Travelfood. gennaio/febbraio. "Mario Marini: The Renaissance Man of Italian Cuisine", Epicurean-Traveler.com, January. "Michele Lirosi: "Co-Founder and Owner of Sicily's First Agriturismo", Epicurean-Traveler.com, December. His Eminence Dominik Cardinal Duka of the Czech RepubliDanec", Inside the Vatican, December. "Roman Paulus e Oldrich Sahajdak: i primi chef cechi a Praga entrambi con una stella Michelin", La Madia Travelfood, dicembre. "Roman Paulus and Oldrich Sahajdak: Prague's First Czech chefs With a Michelin Star", Epicurean-Traveler.com, November. "Geert Van Hecke, il primo chef fiammingo con 3 stelle Michelin", La Madia Travelfood, novembre. ""André-Joseph Léonard: Archbishop of Mechelen-Brussels and Primate of Belgium", Inside the Vatican, October. "Dominique Persoone: Flanders' Most Adventurous Chocolatier", Epicurean-Traveler.com, October. "Davide Scabin: Food designer e ingegnere culinario per autodefinizione", La Madia Travelfood, ottobre. "Laurent Gerbaud: Born to be a Chocolatier", Epicurean-Traveler.com, September. "Felice Sgarra: Lo chef rivelazione 2012", La Madia Travelfood, settembre. "Geert Van Hecke: The First Flemish Chef Awarded Three Michelin Stars","Epicurean-Traveler.com, August. "Felice Sgarra: 2011's Winner of RAI-TV's 'La Prova del Cuoco'", Epicurean-Traveler.com, July. "Andrea Sarri: il nuovo presidente dei 'Jeunes restaurateurs d'Europe'", La Madia Travelfood, luglio/agosto. "Andrea Sarri: The New President of 'Jeunes Restaurateurs d'Europe' in Italy", Epicurean-Traveler.com, May. "Tony May: il pioniere della cucina italiana autentica negli USA", La Madia Travelfood, maggio/giugno. "Marisa May: La figlia discepola e socia di Tony May", La Madia Travelfood, maggio/giugno. "Tantris:il tempio gastronomico di Monaco (Bavaria), La Madia Travelfood, gennaio/febbraio. "Nate and Mary Kate Tate: Authors of Feeding the Dragon", Epicurean-Traveler.com, December. "Joseph Zwilling: Director of Communications Office, Archdiocese of New York," Inside the Vatican, December. "Marisa May: Tony May's Daughter, Disciple, and Partner", Epicurean-Traveler.com, October. "Tony May: The Pioneer of Authentic Italian Cuisine in the USA," Epicurean-Traveler.com, October. "Nick Anderer: lo chef del 'Maialino', il ristorante 'romano' trendy a New York", La Madia Travelfood, settembre. "Monsignor Paul Tighe: Secretary to the Pontifical Council for Social Communications,Inside the Vatican, August/September. "Tatsua Iwasaki: il migliore pasticciere in Italia e giapponese", La Madia Travelfood, giugno. "Fra Giovanni Rossi: Head Chaplain of Rome's Gemelli Hospital", Inside the Vatican, May. "Peter Knogl: Swiss Chef of the Year 2011", La Madia Travelfood, maggio. "Tanja Grandits: Swiss Chef of the Year 2006", Epicurean-Traveler.com, May. "Stephan Geisel: Un esperto di vino (non della birra) a Monaco di Baviera", La Madia Travelfood, aprile. "Tatsuya Iwasaki: Twice Italy's Best Pastry-Chef is from Japan", Epicurean-Traveler.com, March. "Salvatore De Riso: Anche la pasticceria ha ora un volto televisivo", La Madia Travelfood, marzo. "Francesco Buranelli: The Curia's Only Lay Secretary", Inside the Vatican, March. "Peter Knogli: Swiss Chef of the Year 2011", Epicurean-Traveler.com, February. "Father Mark Haydu, International Coordinator of the Patrons of the Vatican Museums", Inside the Vatican, February. "Nick Anderer: New York's Top 'Roman' Chef,' Epicurean Traveler, January. "In the Steps of St. Francis", Inside the Vatican, January. "Salvatore De Riso: Italy's Most Famous Pastry Chef", Epicurean-Traveler.com, December. "Josip Cardinal Bozanic of Croatia", Inside the Vatican, November. "Daniela Kramaric: sommelier e ristoratrice croata", La Madia Travelfood, novembre. "This Very Courageous Young Woman Was My Mother", Inside the Vatican, October. "Giancarlo Zigante; il re dei tartufi istriani", La Madia Travelfood, ottobre. "The Geisel Family:Munich's Best Hosts", Epicurean-Traveler.com, September. "Tantris: Munich's Temple to Gourmet Dining", Epicurean-Traveler.com, August. "Scarello: Il Rinnovamento nel Friuli/Venezia Giulia", La Madia Travelfood, luglio/agosto. "Daniela Kramaric: Croatia's Top Sommelier and Restaurateur", Epicurean-Traveler.com, July. "Giancarlo Zigante: Istria's King of Truffles", Epicurean-Traveler.com, June. "Il caso letterario di Elena Kostioukovitch e del suo libro su un'Italia che ama parlare del cibo", La Madia Travelfood, maggio. "Emanuele Scarello: President of Italy's 'Jeunes Restaurateurs d'Europe'", Epicurean-Traveler.com, April. "Gennaro Esposito: uno dei piu noti chef campani", La Madia Travelfood, aprile. "Elena Kostioukovitch: Professor, Literary Agent, Translator, annd Author", Epicurean-Traveler.com, March. "Stephan Ackermann: Bishop of Trier", Inside the Vatican, March. "Marchesi visto dalle figlie", La Madia Travelfood, marzo. "Fabrizio Molteni", La Madia Travelfood, marzo. "Monsignor Robert T. Ritchie: Rector of St. Patrick's Cathedral", Inside the Vatican, February. "Lea Linster: l'unica donna vincitrice del 'Bocuse D'Or'", La Madia Travelfood, gennaio/febbraio. "Gennaro Espostio: The Best Chef of Italy's Campania Region, Epocurean-Traveler.com, January. "Ilario Mosconi: l'unico chef italiano all'estero con due stelle Michelin", La Madia Travelfood, dicembre. "Sylvie Bisdorff: La Campionessa della Cucina Lussemburghese", La Madia Travelfood, novembre. "Monsignor James F. Checchio: Rector of the Pontifical North American College, Inside the Vatican, October. "Ilario Mosconi: The Only Italian Chef Outside Italy with Two Michelin Stars", Epicurean-Traveler.com, October. "Lea Linster: The Only Woman Winner of the Paul Bocuse", Epicurean-Traveler.com, September. "Jose Avillez: la stella emergente della cucina portoghese", La Madia Travelfood, settembre. "Andrew Nutter: From Child-Prodigy to TV Celebrity Chef", Epicurean-Traveler.com, August. "Sylvie Bisdorrf: Champion of Luxembourg's Cuisine", Epicurean-Traveler.com, August. "Joachim Koerper: l'unico chef tedesco a Lisbona con una stella Michelin", La Madia Travelfood, giugno. "Monsignor Francis D. Kelly: Educator and Author", Inside the Vatican, March. "Vincenzo Conticello: pizza si, "pizzo" no", La Madia Travelfood, marzo. "Restauranteur Vincenzo Conticello: No More "Pizzo" in Palermo, Epicurean-Traveler.com, February 26. "German Joachim Koerper: The Only Chef in Lisbon with a Michelin Star", Epicurean-Traveler.com, December 20. "Vitor Sobral: Mr. Portuguese Cuisine at Home and Abroad", Epicurean-Traveler.com, December 10. "Rich Varano: World Grand Master Sand Sculpting Champion", Inside the Vatican, December. "Jose Cardinal da Cruz Policarpo: Patriarch of Lisbon", Inside the Vatican, November. "Jose Avillez: Portugal's rising Culinary Star", Epicurean-Traveler.com, November 20. "Donald W. Wuerl: Archbishop of Washington D.C., Inside the Vatican, May. "Tom Keller: Il migliore chef degli Stati Uniti", La Madia Travelfood", April. "Antonio Paolucci: Newly-Appointed Director of the Vatican Museums", Inside the Vatican, March. "Dun Gifford: Mr. Mediterranean Diet", La Madia Travelfood, March. "Edward Cardinal Egan", Inside the Vatican, February. "Father Alimsinya Atuire: A Young African Priest Reflects on his Life and Work", Inside the Vatican, November. "Christoph Cardinal Schoenborn", Inside the Vatican, June/July. "Pietro Leemann: Inventore della cucina naturale", La Madia Travelfood, June. "The View From Japan", Inside the Vatican, April. "'Habemus Papam': Pontifical Elections from St. Peter to Benedict XVI, Interview with Ambrogio Piazzoni", Inside the Vatican, March. "Elisabeth Guertler: Vienna's Top Hotelier", Epicurean-Traveler.com, March 29. "Sachertorte and its Namesake Hotel", Epicurean-Traveler.com, March 29. "Pietro Leemann: Italy's Only Vegetarian Chef Starred in Michelin", Epicurean-Traveler, March 7. Cesare Casella: Un ponte tra la Toscana e New York", La Madia Travelfood, March. "Roberto E. Wirth: Born a Hotelier", Epicurean Traveler, February 5. "His Excellency Angelo Comastri: A Life Dedicated to Divine Love", Inside the Vatican, January. "Cesare Casella: A Bridge Between Tuscany and New York", Epicurean Traveler, December 4. "Roberto E. Wirth: Un albergatore nato", La Madia Travelfood, December. "Interview with Peter Cardinal Erdo", Inside the Vatican, October. "Ewald e Mario Plachutta; a Vienna gli imperatori del manzo", La Madia Travelfood, October. "Intervista a Marc Vetri: Lo Chef/Proprietario del ristorante italiano numero uno del Nord America", La Madia Travelfood, June. "The World's Greatest Museums? ", Inside the Vatican, March. "Windows into Paradise", Inside the Vatican, October. "Walter Filiputti: Mr. Eno-gastronomia del Friuli/Venezia-Giulia", La Madia Travelfood, October. "Preserving the Past: Interview with Father Raffaele Farina", Inside the Vatican, July. "Andrea Accordi, un'anima innovativa a Firenze", La Madia Travelfood, April. "Host of Cologne's World Youth Day 2005", Inside the Vatican, April. "Natalia Tsarkova: There's a Light inside of the Holy Father", Inside the Vatican, April. "Elmar Theodor Maeder; Commander of the Guard", Inside the Vatican, March. "Nina Zagat: la musa delle guide gastronomiche americane", La Madia Travelfood, March. "Suzanne Ferrell Nicholson: It's Better to Paint in the Morning", Inside the Vatican, November. "An Exiled Claimant to the English Throne", Inside the Vatican, October. "Andrea Zanfi's Wine Journeys", Epicurean Traveler, July. "An Enterprising Italian Sole: Polegato's 10 Steps to Success and Climbing", Epicurean Traveler, July. "Polegato's 'La Gioiosa' and Villa Sandi", Epicurean Traveler, July. "Descendants of New York's Book Row", Bookdealer, June 24. "Intervista a Bruno Gambacorta, il conduttore di "Eat Parade", La Madia Travelfood, May. "Make Love, Not War: An Interview with Shirley Hazzard", Bookdealer, November 27. "Gualtiero Marchesi: Ambassador non plus ultra of Italian Cuisine," Epicurean Traveler, November/December. "Intervista a Heinz Beck", La Madia Travelfood, June. "Heinz Beck: La Pergola Restaurant, The Magician of Balanced Flavors", Epicurean Traveler, May/June. "Com'è una PIZZA DI SUCCESSO", La Madia Travelfood, March. "Gianfranco Vissani: Italy's Outspoken Bocuse", Epicurean Traveler, February. "The Latest on Pizza: Italy's Best Pizza", Epicurean Traveler, February. "On Byron and Biography: An Interview with Fiona MacCarthy", Bookdealer, February 20. "Louise McDermott's Italica Books", Antiquarian Book Monthly, October. "Claudio de Polo Saibanti", Antiquarian Book Monthly, July. "Un Turco italiano", Film Cronache, marzo/aprile. "Island Life", Qantas: The Australian Way, October. "Your Very Own Perfume" Golden Falcon, May. "The fragrance makers", The Australian Way, March. "Artist's Corner: Franco Zeffirelli", Europe, April. "Talking with Poet Laureate Consultant: Mona Van Duyn", Wilson Library Bulletin, October. "An Interview with Leo Lionni", Wilson Library Bulletin, June. "Francis Steegmuller: A Life of Letters", Wilson Library Bulletin, January. "Caroline Feller Bauer: The Pied Piper of Children's Books", Wilson Library Bulletin, January. "Shirley Hazzard: Back to Basics", Wilson Library Bulletin, November. "William Weaver: The Making of a Literary Translator", Wilson Library Bulletin, May. "The Hard Life of Santa Claus", Eurochic, June. "Presidential Envoy? No. Ambassador", The Messenger of St. Anthony, July/August.